A quick and easy economical and family friendly recipe! Place sausages in a saucepan filled with water and boil on stovetop for approx 20 mins or until skins have begun to loosen, water has boiled and sausages have begun cooking. Drain cooked sausages and set aside to cool. Finely dice onion and cook in a large saucepan/pot (can be same saucepan, cleaned) in 2 tbsp olive oil, until translucent. Dice carrot and celery to same size. Add to saucepan when onion is cooked through and stir well. Leave cooking for about 5-10 mins to allow veg to begin to soften. Stir periodically. Remove skins from boiled sausages and discard. Chop sausages and add to saucepan once veg are beginning to cook. Add curry powder and water and cook on a medium heat for approximately 30 mins. In this time, the sauce should thicken but if you find it too watery, mix 1 tbsp cornflour with hot water and pour over sausages, stir through well and continue cooking. Prepare rice separately and when curried sausages and veg are ready and the sauce has thickened, serve atop the rice. Notes... I use 'Keen's' curry powder. The amount used can vary depending upon the strength your family can tolerate! I have often substituted regular sausages for flavoured varieties eg chilli, lamb and mint, herb and onion etc. This makes for a tasty variation on the original. A lovely recipe, thank you for this. 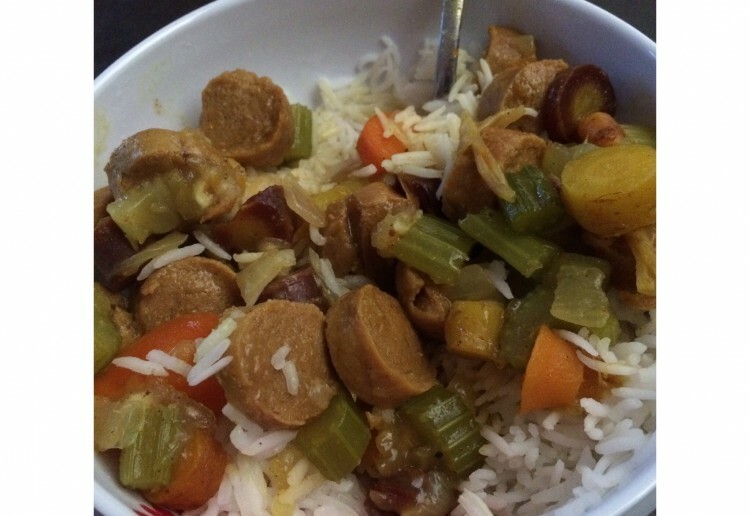 It’s funny we just had curry sausages for dinner,l like your recipe and it look’s amazing! Thanks. great idea tracey – love all the veg. This meal has always been a hit in my house hold. Simply beautiful. Look so mouth watering ………yum. I like a good curried sausage. This looks like a good recipe with the rice. Haven’t seen the heirloom carrots? But I suppose I can use the normal carrots in its place. Thanks for sharing.